Born and raised in Perak State, Malaysia, Mohd Nassir Rashid started training kayaker at age 23 with one of higher education in Malaysia. After earning a degree in Computer Science from Malaysia Science University, Bill founded Xventure Outdoor Company in 2010 with three rafts. 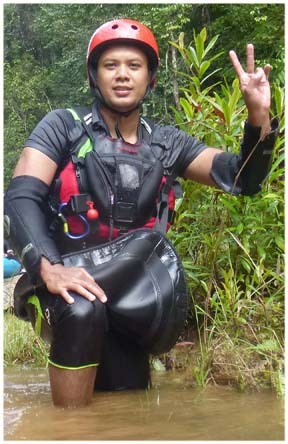 One of the pioneers of white water rafting, Nassir has successfully built his company, Xventure Outdoor, to be one of the largest Malaysia rafting company guiding more people on more trips in Malaysia than any other Malaysia rafting company. While he has a number of descents and raft runs in Malaysia and beyond to his credit, Nassir says it is his influence on guiding that he is most proud of. "My goal is to help foster an inclusive, nurturing style of guiding that helps people move from fear to confidence to joy." he says. "The idea is to inspire openness, trust and true camaraderie." Ranging in age from 19 to 65 and comprised of men, our Xventure Outdoor rafting guides hail from Kuala Kubu Bharu, as well as from Ulu Slim at Tanjung Malim.They are talented professionals who have guided rafting expeditions throughout Malaysia. All bring a wealth of knowledge regarding the local river ecology, geology and wilderness environment in which they are based. Above all, each Xventure Outdoor guide is friendly, caring, kind and lots of fun to be around. Many of our rafters return year after year and request guides they have rafted with in the past.